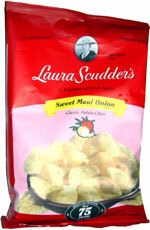 Taste test: These chips were very good, especially if you like onion-flavored chips. There was a ton of flavor powder, leaving extra residue on your fingers. The taste was like a sweet onion, not too salty or powerful, but still with enough onion taste to make you grab for the mints after you finish eating. Smell test: An oniony smell wafts up from the bottom of the bag. This snack was discovered by Keith at San Francisco International Airport. Review published .